My name is Bill Anstine. My e-mail address is vetteattheonramp@email.msn.com I live in Akron Ohio. My car is a 97 Torch # 9670, 82nd from the end, that was built the last full day of production of the 97's. My options are F45- RTD, MX0-Automatic, G92-Perf axle, AQ9 Adjustable sport leather seats, AG2-6 way power pass seat, CC3-Transparent roof, CJ2-Dual zone Air, T96-Fog lamps, B34-Front floor mats, AAB-Memory package, B84-Body side moldings, UN0-Stereo with CD in unit, U1S-Remote CD 12 disk changer, D42-Luggage net, 193-Black Leather interior. In essence, all the options with the exception of the dual roof. A visit at the NASCAR Café at Myrtle Beach. Our three C5's are in front of the Castle Club House at the Legends of Myrtle Beach. It was taken late January at a mini C5 event of myself, Bob Hardt and Gary Hunsberger. A view of my plate and the Corsa exhaust. My other cars in the garage I built specifically for it. They are in summary 54, 60, 67 427/390, 76,93 40th Anniversary Convertible, 93 ZR-1, 95 Pace Car, 96 LT-4 along with the 97 driver. 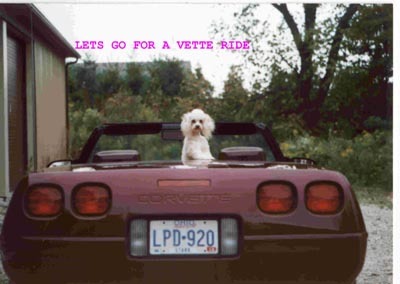 We are a Vette family right down to the dogs. Leave the door open and they are in and ready to go. This guy knows when we take off he has to lay down and hang on. When we level out he sits up and looks around. This was on the way to Beach Bend for the Active Handling demonstration . It was a pretty site in the rear view mirror. This is the pin I used silicone to apply them to my wheels, for the little touch of class and color. That is all it took to make me happy with them. 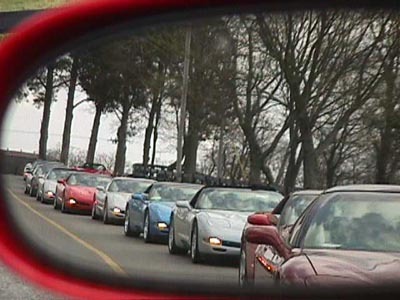 My first recollection of the corvette was when a local guy and his brother bought matching burgundy Corvettes. I think they were 65's. What a grand memory they were. They were like two chip monks chasing each other. They would zip and dart, but what a sight. My oldest car is a 54 that was owned by a gentleman for 36 years. He took it on his honeymoon when he got married and sold it to fund his retirement. I wanted one of the first ones but didn't know how to go about finding one. While we were at the Bloomington Car show we met the gentleman who founded the 53-54-55 Registry, Ken Amrick. A quite nice and helpful fellow enthusiast. He suggested I join the registry even though I didn't have a car and advertise free that I was interested in purchasing one. I got a couple of calls and hadn't even gotten the news letter yet. I guess the mail got to others quicker than I got mine. The first call was too far away. My son took the second call. He took all the information and promised to relay it. You never take the first one. Isn't that the rule? But it sounded so perfect to what we were looking for. I had looked at other cars and they never turned out to be as good as they looked over the phone. We went to look. It was less than two hours away. This car was exceptionally good. It fit our requirement's perfect. The owner was a Corvette Judge for NCRS events also. His specialty was interiors. So needless to say the interior is fantastic. The last time he had it judged was 1991. It was awarded 95.3% NCRS. And that was with non original headlight bulbs and non original battery. We made the deal and there was a cover on the car when it was in his garage. I asked if the cover was included. There was a pause and he finally said yes. He asked if I knew the story behind the cover. As a matter of fact, I didn't. He told of how when the cars were delivered in 54 they used a special heavy cover to keep the dirt off the cars. This was one of the original covers used to deliver cars back in 1954. Needless to say, I was quite grateful he allowed me to have it. It was quite emotional for him to leave the car go. I know there were a lot of memories that remained behind as I drove it home. He and his wife followed us for a fair way before they disappeared from sight. This was a later acquisition in my group of cars. But this is the car that I saw in a picture of in an amusement park arcade when I was younger. Maybe you recall those days when we would by a $50 car and run it until it died. Didn't even change the oil because it went through it so fast it was always clean. We must have spent fifty dollars getting enough tickets to by that picture of a 1954 corvette. I could have gone anywhere and bought it for 12 bucks. That picture hangs in the center behind where I park the 54 in my garage. The next car is a 1960. It was white when I bought it but I always wanted a red one with a white cove and a white hard top. The common most picture of this body style shows that color combination with the beautiful blue water behind it and a white hard top. I saw this car on a dealership floor. I was there inquiring on a new Corvette. I ended up buying the new one, but with all my free time in the negotiating, I spent looking at the 60 out of the corner of my eye. I asked the salesman if it was for sale and he said he didn't think so. I knew it would be expensive because it only had 29,000 miles on it. It belonged to one of the owners of the dealership. He also told me he thought it was a 57 Corvette, but he knew the milage was original. He told of how no one was permitted to drive or be in the car. I didn't know too much about the older Corvettes so I took him at his word. Even though we just bought a new Corvette, in my conversation with my wife, she could tell how much I liked the so called 57. Well unknown to me, my wife called them up and asked them to find if it was for sale. She negotiated a good price and the salesman said, "Oh by the way, it is a 60, not a 57 like I told you." Now she didn't know what to do. Did I like it because I thought it was a 57 or did I like it because I like that style? Her intention was to buy it as a surprise Valentines Day present. She became afraid and asked my son if he thought I would like it. He started laughing. He told her he was sure I would be quite happy. She was still afraid so she ended up telling me and spoiled the surprise. To me it was a giant surprise. And the 60 is exactly the car I liked and not the fact that I thought it was a 57. I negotiated some more and got it for what was an exceptionally low price. A week or so after I had it home I called the dealership to ask a question on the other car I bought. In the middle of the conversation he said, Oh, I forgot to tell you the owner has the original hard top that goes to the car. My mind started racing wild. I concluded they didn't tell me about it to begin with because they knew I would try to include it in the original negotiations. I also knew the hard top would add about $2,000 to the value of the car if it was in fairly good shape. Now I have had the car for a week and know I got it for a very fair price based on no hard top. There is no way I can pretend that I expected it could come with the car. I hope you are keeping this all in mind that it is flashing through my mind while I am on the phone. So I said, OK, how much does he want for it. The salesman said, "Oh, it is included with the car, I was just supposed to tell you that you had to go pick it up." It is a miracle I didn't have a heart attack that day. I picked it up and it was in outstanding shape. Everything about the car was perfect, with the exception of the color. And the condition of the paint was so good I could not justify painting it. The car is so special that I only drove it on special occasions. Eventually a paint section chipped and then a second. They were small, but it was justification in my mind to have it painted. The guy who did it for me also judges car shows. We you remember how I said it was important for me to have it just like the picture. Well when the guy and I discussed the details, I told him red with a white cove and the hard top was to be white. He called after some time and told me it was finally painted. He joked of how he almost made a mistake by painting the top white. The original hardtops for that year did not have white as an option. He laughed how he wrote down white in error but assured me that they did not make the mistake and it was in fact, proper in red. To keep the story short, they ended up painting it white. Which is the color it started with. This car set on the show room floor for 15 years. It was kind of a signature for the dealership. I was amazed that I not only was able to buy it, but at a good price too. I kept looking for defects and couldn't find any. Shortly after that the dealership changed ownership. I concluded they sold it because of the dealership change. Now I was confident the 60 was a gem. The 67 was one of those deals you run into when you are not intending on doing anything. I had hoped to have a car from every generation some day. And like every other corvette enthusiast, the mid year is cherished. And also like every little kid that wants to be a policeman or fireman, I wanted a split window. We saw a 64 advertised at a fair price that was about five hours away. I called and we talked, he sent me a video of the car. It looked great in the video. So we made the appointment to go and look at it. The whole way there my son and I were like two chipmunks. I can tell you we were really excited. We got there and we had built this car up so much in our minds that it was a gigantic disappointment. Stress cracks, didn't run right, window scratches, chrome scratches, the dash was terrible, and on and on and on. We were polite and dismissed it. Guess we were just expecting too much. That was a sad trip home. Going over how we missed seeing the obvious things in the video and so forth. It was a 64 and maybe that is what we should expect to see in a car of that vintage. Some time passed and we decided to go to a dealer that specializes in vintage cars. This place was about four hours away. My son and I again went and we joked about this being a trip to set our level of expectations for future shopping. When we got there, you talk about two kids in a candy store. We never expected to see so many classic cars and in such a wide variety of conditions. We looked, read and looked and looked and looked. But there was a 67 Sunfire Yellow with the black stinger on the hood and those neat numbers that say 427, that kept pulling us back. We started looking into it closer and it was perfect to what we would select. It was a frame on restoration that was done very well. The documentation was in a packet that was about an inch thick. It had pictures showing the stages of restoration. There were all the receipts to show the work performed. The engine was rebuilt less than 4,000 miles prior. It was beautiful. It had all the unique options. Great color, the big block 390 engine, side pipes, aluminum wheels with red line tires, tinted windows, power windows and power brakes, head rests, Teak wood steering wheel in excellent condition, the speed warning indicator and an automatic transmission. In summary, a beautiful car that was capable of racing from that era with all the luxury options. We set down and talked some preliminary prices for the 67 along with a couple of others. My son and I drove away from their location and it was hard keeping the emotions in. I didn't want to buy a car based on emotion. The product had to be in line with the price. So the first point, it was. It was a good product. We drove a couple more miles and caved in. We went to the first phone we found and called my wife. Did a phone conference and found we were almost all in agreement to follow up some more. Let me rephrase that, there was not any who totally disagreed. That's better. We went back and asked some more questions, did some negotiating and before we left had made arraignments for delivery. This was the perfect mid-year for us. My 76 was the very first Corvette I ever owned. And to be real honest, before that I never really had a great desire for a Corvette. My true want was to own a 60's Jaguar XKE. Every time I would find one, it was always a lot more money than I could justify at that stage in my life. I saw the 76 while driving by the house of a gentleman whose company serviced mine. I called him and asked if it was his and in fact was. He was selling it because he felt it was too immaculate for him to drive. It had less than 7,925 original miles and it was just as it drove off the show room floor. The only worn part on the car was the one set of keys from starting it and pulling it on and off a car carrier for various car show entries. He invited me by to look at it and to be polite, I committed to do so. When I saw the car I had never reacted like this before. He told me all about it and it was just like new. He told me what he wanted for it and I politely told him I would think on it and let him know soon. We left there and stopped at a convenience food store on the way home. My wife went in and meanwhile four guys on spit shined Harleys pulled in. They were talking about the 76 Corvette that they looked at the day before. They were on the way back down to look again. They kept saying it had to be in a super bad wreck to look that great. It was impossible for them to think it was original. I listened in, knowing the credibility of the gentleman that owned it, which was very good. And that he knew the people that owned it before he did. I didn't want to offer what I knew in case I did want to make an offer. For the fun of it I got the books to see if it was a good value or what the story was. The price was at the high end of the scale but knowing it actually was a brand-new car kept working on me. You know the story, I got almost no sleep that night. The next day my wife and I reasoned it out and made the decision to go ahead and buy it. We would kick ourselves later if we let it go. But I kept saying, the low milage will not affect me. I plan to drive this car. The 93, 40th anniversary roadster was a car I wanted in the worst way and could not justify it. The color was beautiful in the sunlight. It had such a soft pearl glow. The new features in the C4 were fantastic. All these things were great, but I just couldn't justify it. I had too many cars as it was and had no place to store it. It was one of those things that just keep eating at you. A lot of things were changing in my life at this time and I did something I wanted to do for a long long time. I had just quit smoking, after 27 years of enjoying it very much. And I could have picked up another cigarette and continued right where I left off. My ability to resist was getting weaker and weaker every day. To the point where I almost would put my head out the window in hopes the guy in front of us was smoking. I decided to buy the 40th anniversary and commit to myself that if I "ever" smoked a single cigarette again, I would offer to sell the 40th the next day. I still have it and at this point it has 555 miles on the odometer, as it sits. I could pick a cigarette up in a heart beat, but haven't. The 93 has kept me around to enjoy my cars a little longer than I would have without it. The 93 ZR-1 is another car that came about when you don't want it to. My buddy Rick called up again and said, "why don't you stop by some time soon. Got something I want to talk to you about." With Rick, hard telling what it could be. So a couple days later I swing by. That cotton pickin smile of his. He says let me make you a deal on this ZR-1 on the floor. My first words were, "that is suicide. Not by the car, by my wife." We joked back and forth and I was ready to leave. His final words, "I'll make you a deal you can't refuse." I told him to put together his best deal but there was somewhere between little and no chance it was going to happen. I became the owner of a 93 ZR-1 because Rick made me a deal I couldn't refuse. It sits with about 2500 miles now. And that included a trip to Bloomington and back that was about 1500 miles alone. What a pleasure. A very large dealership advertised a snow ball sale. We were invited to go up and look at the new 95 Corvettes. They advertised having 78-80-90 in stock, I don't recall, but it sounded like a car show. So we decided to go just to see all the Corvettes. Well you can't look at Corvettes without taking one out to drive. So wouldn't you know it he takes me in a red 95. My weakness is red. It had the basic stuff on it. It wasn't all that special, but it did ride better than my 90. Then we went to a parking lot. The snow was about five inches deep. He told me how he was going to demonstrate the ASR. All I could see was us getting stuck and having to walk back 3 miles to the dealership. What it did, blew me in the weeds. It was great. He let me drive and all I could remember was my wife taking the 90 one day. She hit the gas a little too hard, did a donut and came back home scared to death. It is amazing how these guys make it so easy to "make the deal today." As long as my 90 was everything I told them it was, we had a deal. During these discussions and our sight seeing, it is when we saw the 60. And since I traded in the 90, I stopped getting harassed about buying cars and never selling one. My insurance agent gave up asking what car I sold when I got one now. She just started asking whose name it was in. The unveiling of the 95 Pace Car was quite a reward for us. Our family has always enjoyed indy cars and the connection was an automatic smile. The 95 was so clean and sharp, they could have put a Blue Flame 6 in it again and I would like it just as well. We went to Bloomington and it was advertised how there would be a Pace Car offered at the auction. I made the arrangements so if another one of the "once in a life time" deals came along, I was ready. I passed up on the most fantastic sale of a blue 54 because I was interested in the Pace Car. After the 54 was gone I had that sick feeling, but I stuck to my game plan. The time came and the 95 Pace Car rolled into the area. The price went up quickly and was more than I thought it would be. Now I was really sick about the 54 we missed out on. We were back home for about two weeks and my wife wanted to go to a near by shopping area for some miscellaneous things. I dropped her off and said we were going to go to the Chevy dealership in that area who often had 6, 8 or 10 Vettes in their lot. When we got there, wouldn't you know it, they had two Pace Cars in their show room. I didn't know if it was going to be a stroke or a heart attack, but I was sure it would be one of them. A salesman came up and asked if we needed help. I told him I was interested in talking to someone on one of the Pace Cars. He said they were for sale but there was only one person who could discuss them. He would go to get the guy. The salesman was checking every 15 minutes to update me. After waiting for 45 minutes to an hour, the young man came out and said I am afraid the guy you need to talk to informed me he will not be able to talk to you at this time. If you leave your name and number, he will call you when he can discuss it. I left my name and etcetera. As I turned a heavy set businessman was casually strolling in front of the window, carrying his brief case and sucking on a giant cigar. This may or may not have been the guy I was waiting for, but it left that bitter impression. We scrambled to get back to my wife who was finished and standing at the curb. In fact this was her fourth time there, checking to see if we arrived yet. We shared our excitement and disappointment with her. Partly to share the experience but mostly to tone down the flared temper. As we drove on it occurred to call another dealership. Maybe the Pace Cars weren't as scarce as we thought. We talked to the sales man that sold us the 95 and 60. He did have one on the floor. I expressed I was interested but had just seen one and he had to get us his best deal up front. We were on the cellular phone and I gave him that number to call us back, assuming he would call within 15 to 20 minutes. The call never came. After the rejection at the other dealer and now at the one we had a relationship with, we were really getting depressed. Two days later, we were on the way to a Cleveland Indians game. The cellular phone rang and it was the salesman. He apologized for the delay but to get his best deal, he had to talk to one particular guy. He was finally there. He gave me the price. So I agreed to call him back with an answer. We talked and concluded the price he gave us was better than anything we had seen, based on all the calls, shopping and the experience at Bloomington. We decided what a price would be, for us to consider it a good deal. I called him back and gave him the price. I offered for him to call me back but he said to hold the line and he would try to get a quick answer. Two minutes later, he came back on and said it's a deal. The Pace Car became known as the car we bought on the way to the Indians game. Indians tickets were really hard to get and these were real close to third base, 11 rows up. It was real hard to sit there, but the seats were so special. Then it started to rain, well actually a sprinkle. That was it. Jumped in the car and drove an hour to see the Pace Car. Great day for a ball game. It presently has 350 miles on it. It was getting pretty obvious I had to build a garage to house my cars. My wife will tell you that the garage was built to hold all the pictures, signs, and trinkets. And maybe there would be a little extra room to keep the cars in. The plan was to build it 30 by 40 which was the largest Zoning would allow in our neighborhood. Then I would be able to keep the rest in the garage attached to the house. We were to start soon and we went to Bloomington. I had seen the lifts before but this time it tuned on the light. I figured that if I raised the roof two feet, I could keep up to twelve cars in a six car garage. That was the solution. I came home and changed the lumber order right away. The mason was working on the footing while we were away, so this was at the minimum of opportunity. We were finally drawing near being done. It was costing me so much having the cars stored everywhere and not to mention the worry. Not necessarily worry of theft as much as the damage mice could cause. Those little critters were the real fear. The drive way was not done yet and I put in a vinyl checker board floor. So I was fearful of destroying the floor if I got gravel cinders in the vinyl. Now is when we could have won on Funniest Home Videos. We took twelve feet long boxes and drove the car on them. Put another pair down and drove forward again. Moved the back and kept going that way. I didn't think it went too bad because I was driving the car. But my son, wife and father-in-law were sure doing some scrambling. They did a great job and we never got a mud spot on a tire. I got to say I am glad Zoning didn't make the restriction any less. I never would have had enough room for my pictures and signs. I had never been to the National Corvette Museum. My son and I decided to fly to Nashville and rent a car to go to the Museum and tour the plant. The last year of the C4 and I heard of how the Corvette plant was going to change the way the assembly line worked. Everyone told me to go now and then go after the new line was up and running. It would be quite an experience. In the back of my mind I thought it would be nice to have a yellow LT-4 in the last year of the C4 production, since we had one from the last year of the C2. The Competition Yellow was the choice of my son. This time I thought I would wait until the new models were out and I would be able to get what we wanted at a very reasonable price. This was April of 96 and the plant would be shutting down shortly to retool for the new car. In fact some of the tour was cut out because it was starting on other sections. We went on the tour of the pant and half way through, we realized we hadn't seen any Competition Yellow cars. We asked the tour guide and he said they discontinued the color a long time ago. We would be fortunate if we could even find one. Well when we got back I started making calls right away. The tour guide was right, trying to find one with all the options we wanted was very difficult. So much for waiting for the good price. We finally located a Competition Yellow, LT-4 with the 6 speed, real time damping, tan interior, the bronze roof that complimented the tan interior, the CD, and the EMT tires with the low tire pressure warning system. We wanted the sport seats but couldn't locate one with the other options and the sport seats too. The seats were quite comfortable it was not the high priority. 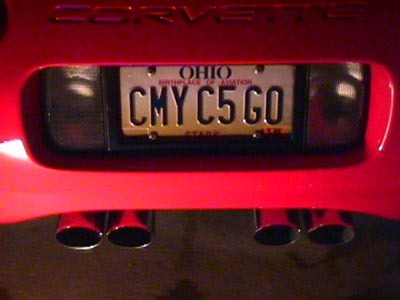 The C5's were coming out and I was sure with the history of new releases that I would wait a couple of years for a C5. That would be a blessing on the budget too. I still kept up with all the information as fast as it could be fed to me. Excitement grew but was restricted because I knew how great the 96 was. There was a little bit of improvement each year but not a priority. Plus I had the 95 as the driver and it was quite the luxury ride. The 96 had my respect and would scoot if I desired. The more the articles came, the more curious I was. The big day was coming. I could hardly wait for the announcement of when it was. Bummer, it was the Friday before we got back form vacation. No big deal, I am just going to look anyway. So many articles had come out now and kept telling of how the C5 was the most tested Corvette ever. All the technology that went into it was amazing. The wheels got to turning but was very slow. I was still reluctant to do any thing. We decided to go look at it on Monday after we got back. We called the dealership that was supposed to have a lot of the new cars to see if they had any in. They still had a couple. We went up to look. I was impressed with the looks. All except that big back end. It was time for me to take a ride. I was absolutely amazed. This is not the same car with the few minor changes like I expected. This was great. The articles said anything that was questioned as a problem was addressed and redesigned. It was true. My wife drove, my son drove. I was beside myself. I naturally got prices and laughed when they told me. Not only was it over sticker, it was big bucks over sticker. Reality set back in and said, I think I will have to wait a couple of years. On the way home it kept working on me. We put together a plan. If we could sell the 95 and "if" we could get a C5 for the right price, maybe we could pull this off. As soon as we got home I called my buddy at the dealership to see what I could expect for my car and determine if the plan could go together. It just so happened he knew of someone who was looking for a red C4. He in fact had missed buying two other ones for various reasons. As it would be, my 95 was basically sold within three hours after I got home. Now to the second part. I had to be able to buy a C5 to replace it. I knew I could drive the LT-4 while waiting for it so that wasn't a problem. And the wait may be kind of fun at that, banging gears in the LT-4. It ended up being two weeks after the unveiling that I was able to order the C5. It allowed time to make sure the 95 financing went through, to negotiate and to make sure I was comfortable with the decision. I am sure some emotion went into the decision too. We were on the wait list now. This was a new experience for me. I never had to wait more than a week for a car. Well this wait ended up being 19 weeks. 19 long weeks. We were in the local dealership and my wife talked to the owner of the dealership. She asked, "you know the covers that were special to cover the new Vettes? Is there any chance you could talk to a rep or someone that may know where we could buy one." We knew he had the one for their dealership, but he is quite fond of Corvettes too. We were sure he would keep it or sell it with his C5 that came in. The next day they called and said to come pick up our cover. We were puzzled. Here the owner sold us his, and we never dreamed he would do that. During this idle time I had struck up conversations with some others who had C5's already and some that were in the same wait pattern as I was. This contact was through the internet. Little did we know this was going to turn into almost a family thing. Constantly trading notes. Did you hear...... I heard...... This article........ That gossip? The day finally came. As it ended up, my car was 82nd from the end. So in essence, built the last day of production for the 97. What do I think? It was worth every minute. Every story. Every second. When I drove it anywhere, I can see what the people experienced when the 53 first came out. Or the 63, the 68, the 84. The smiles and thumbs up from the optimistic ones. The thumbs down from the pessimistic ones. But everyone had an opinion. And there was enough built into the car that you still knew it was a Corvette. The initial shock has gone on the big back end and I am happy to say, without a doubt, the C5 truly is the "Best Vette Yet." I have had the pleasure of a lot of excitement through the efforts of the National Corvette Museum. The Chat Room, their information, the Museum, and their special events. I had the luxury to participate in the Labor Day event last year and it was nothing but excitement, day and night. Good fellowship by everyone. And almost every conversation started with, "what year is your Vette." Two days etched a memory forever. And in those two days the special people from GM were as kind and courteous as anyone could be. Never once did I see anything but a smile and hi, how are you, glad you could attend. John Carfaro's cheeks had to hurt from smiling so much. And never did he turn anyone away. Jim Minneker, Dave McLellen and even the people putting the plan together looked as though they enjoyed what they were doing. Wil Cooksey, Earnest Foote, and on and on. They were all celebrities and great hosts. Wendell Strode, the NCM Director, can be proud of how it came together under his direction. 40 plus years ago, I am sure they never expected to be breeding such a large family. 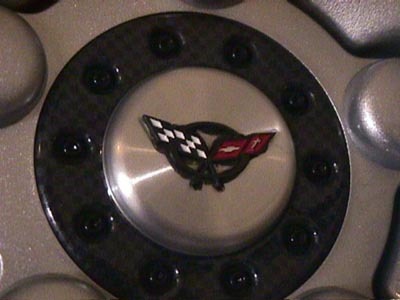 But every Corvette owner can be proud to be part of the family.